Monopartite, linear, dimeric, ssRNA(+) genome of 9,75 kb, with a 5'-cap and a 3’poly-A tail. There are two long terminal repeats (LTRs) of about 600nt long at the 5' and 3' ends. The LTRs contain the U3, R, and U5 regions. There are also a primer binding site (PBS) at the 5?end and a polypurine tract (PPT) at the 3’end. The integrated provirus utilizes the promotor elements in the 5? LTR to drive transcription. 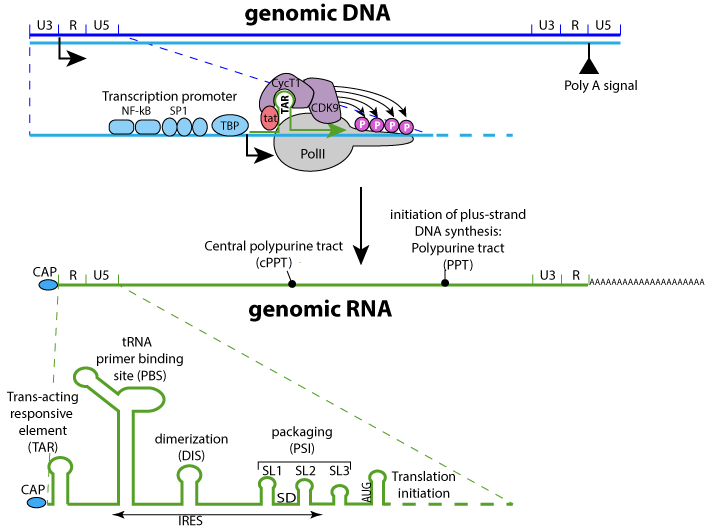 This gives rise to the unspliced full length mRNA that will serve as genomic RNA to be packaged into virions or used as a template for translation of gag and gag-(pro)pol (1 ribosomal frameshift) polyproteins. 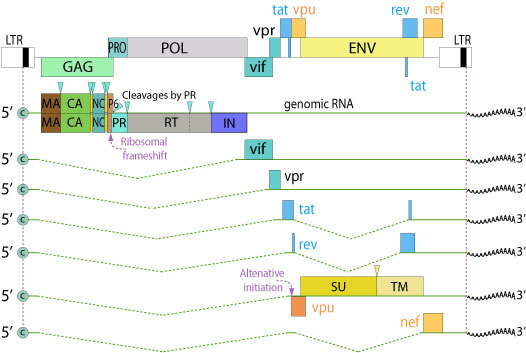 The uncompletely spliced mRNAs encode env that is cleaved into SU and TM envelope proteins, and the accessory proteins vif, vpu, and vpr. Completely spliced mRNAs encode Rev, Tat and Nef accessory proteins. Rev escorts unspliced and uncompletely spliced RNAs out of the nucleus of infected cells. The HIV resource is supported by the Swiss South Africa Joint Research Programme.